Trending at $375.00Trending price is based on prices over last 90 days. Trending at $324.99Trending price is based on prices over last 90 days. 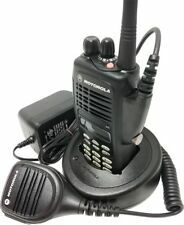 11 product ratings - Motorola Mototrbo XPR 3500 radio, charger and case.capacity plus. Motorola GTX-900 Two-way Radios: LOT OF 15!!! Twelve Working Radios, w/TWO Rack Chargers!!! 2 Motorola PR400 16 Channel VHF Radios, in good condition.